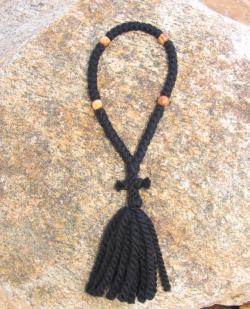 Russian Style: A bead after every 10 knots; completed with a cross and tassel. 2-Ply – This is the thinnest yarn and makes the smallest knots. 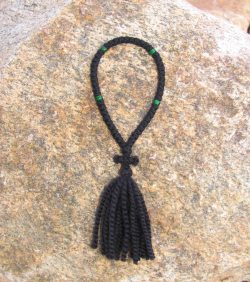 Each knot is approximately 3/16" in diameter, and the prayer rope is approximately 7.5" long. 3-Ply – This is the intermediate size of yarn and comes from Greece. Each knot is approximately 1/4" diameter. 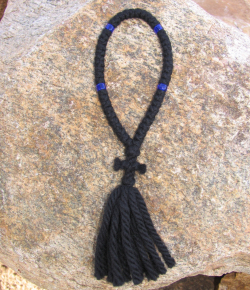 The prayer rope is approximately 8.5" long. 4-Ply – This is the thickest yarn and will make the largest prayer rope. Each knot is approximately 5/16" diameter, and the prayer rope is approximately 9.5" long.